The Hacienda de San Rafael, once a thriving olive estate, has been meticulously restored and converted into a luxury hideaway striking the perfect balance between rustic charm and modern sophistication. 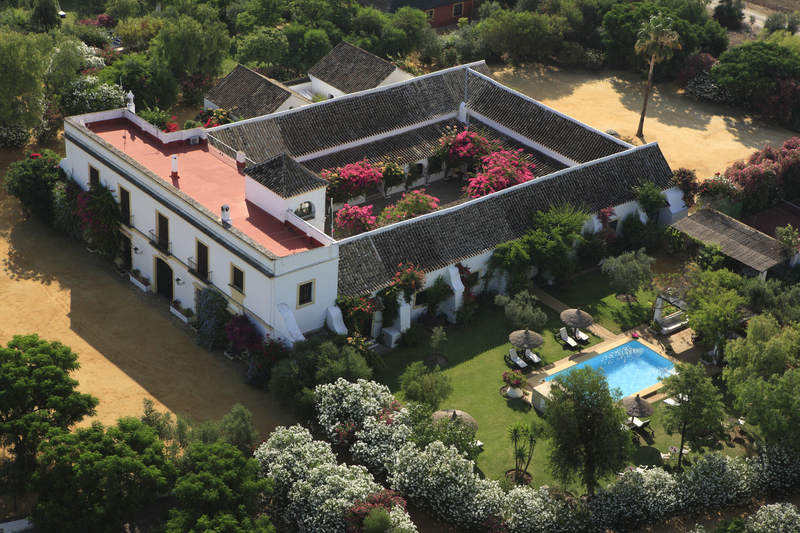 This privately owned eighteenth-century hideaway is perfectly positioned halfway between the historic cities of Seville and Jerez de la Frontera. As well as providing the perfect setting for an intimate getaway, the Hacienda is ideally located for discovering the charms of Andalucía. To the east of the Hacienda is the Sierra de Cadiz where the famous white villages are located. Westwards lies the Doñana National Park, one of Europe´s most important wetland reserves. To the south east is the dramatic coastline of the Atlantic and the Costa de la Luz with miles of sandy, wild beaches. The eleven duplex rooms are situated around a bougainvillea filled courtyard, each with its own veranda, perfect for enjoying breakfast in the morning. The interior décor bears the signature of the Hacienda´s designer, Kuky Mora-Figueroa, who has used fabrics, antiques and artefacts sourced on her extensive travels to Asia & India. 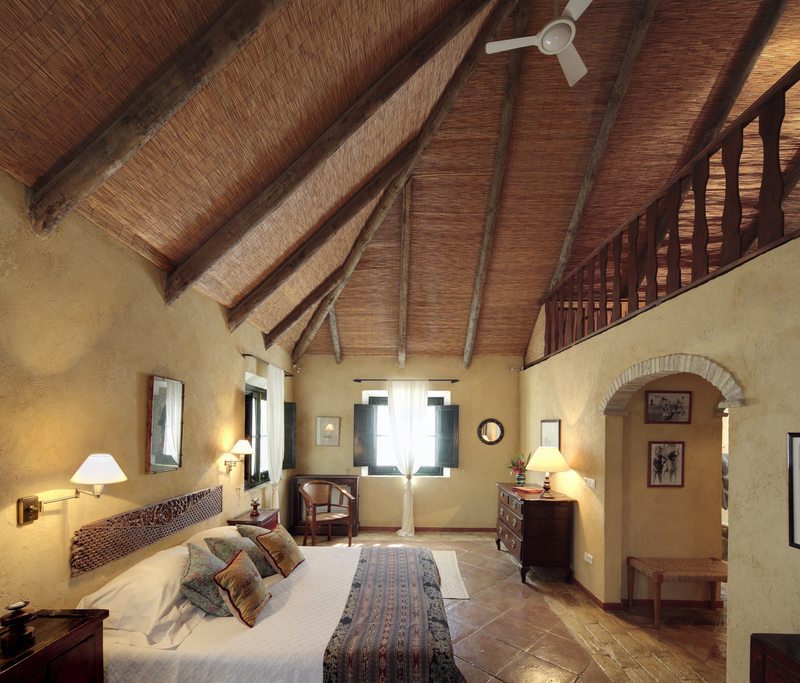 For something extra special, the Hacienda has three casitas offering the ultimate in rustic chic. They lie in a private garden with a shared infinity pool; each has a large bedroom, separate living room and an upstairs siesta zone. An outside “chozita” offer guests a comfortable day bed for relaxing or individual dining. The restaurant embraces good simple Mediterranean cuisine. The chef produces an outstanding selection of recipes with an emphasis on local, seasonal produce. Whenever possible dining is alfresco. The Hacienda also is available for exclusive use. It provides a unique venue for organising private celebrations including birthdays, anniversaries, parties and weddings. It is also an ideal location for corporate functions and fashion shoots. - 11 deluxe rooms & 3 casitas - 28 in-house guest capacity - 5 acres of well maintained gardens - 3 swimming pools - Tailor-made programme - Flamenco entertainment - Private transfers - Three course dinner for 100 guests (in-house catering) - A selection of party menus - Photographers - DJ’s. Inquire for prices and specials. Please email us dates, how many people and preference in accommodations.